Duration: 5 – 6 hours approx. Passengers board motor coaches for a 45 minute ride to the town of Gamboa where the Panama Canal Dredging Division is located. Once in Gamboa, passengers board the Pacific Queen to start the water portion of the tour. We enter the canal at the north end of the Gailard cut, where the Chagres River flows into the canal. The Gaillard Cut (also known as Culebra Cut because its curves resemble a snake) is one of the main points of interest for visitors because it was carved through the Continental Divide and this section of the Canal is full of history and geological value. 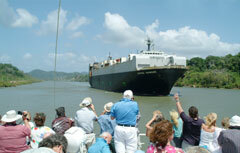 The Pacific Queen will travel the Cut’s 13.7 kilometers on the way to Pedro Miguel Locks. As you transit the Cut you will be able to appreciate the continuous maintenance that this area requires, because it is very susceptible to landslides. In this area you will also be able to observe the work in process for the Panama Canal expansion project. Before reaching the Pedro Miguel Locks at the southern end of the Cut, you will be able to view the new Centennial Bridge which crosses over the Canal. Next, the boat will enter Pedro Miguel Locks, which is one of the two sets of locks on the Pacific side, and here the vessel is lowered 9 meters in one step. You will then enter Miraflores Lake, which is a small artificial body of fresh water that separates Pedro Miguel from Miraflores Locks, the latter being the final set of locks before reaching the Pacific Ocean. At Miraflores Locks the vessel is lowered 18 meters in two distinct steps. Once in the Pacific Ocean the vessel will sail to the beautiful Amador Causeway where passengers disembark. On the way to Amador, you will pass under the Bridge of the Americas, and later, you will be able to admire the Bay of Panama and Panama City’s splendorous skyline. Transportation by bus from Flamenco Resort & Marina (Amador Causeway) to Gamboa where the tour starts. Price: Adults $180 USD. Children (under 8) $120.